The Core-Max® Expedition is a lightweight and versatile pediatric TLSO incorporating all the benefits of a traditional SPIO® orthotic with the SPIO® X-Panel system; a rigid posterior trunk support system. 1. The Core-Max® Expedition provides abundant and consistent proprioceptive input via compression. SPIO® orthoses provide two and a half times more compression than athletic compression wear. All SPIO® Orthoses are made of a high quality, specially milled fabric that is lightweight, wick-able and breathable. The unique SPIO® Orthoses fabric maintains its compression, even after prolonged use and features high rebound properties and a strong neutral memory that assists the wearer in returning the body to mid-line. · Both panels simultaneously to provide maximal support. · X-Heavy to provide significant support. · X-Light to provide less support. · Stays, provided with the system, when minimal support is needed. 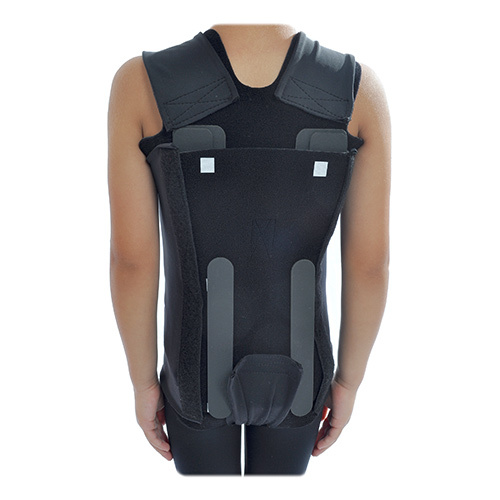 · The neoprene back panel alone, to provide compression without mechanical support. The Core-Max® Expedition can be utilized for a broad spectrum of children with varying levels of hypotonia. As a child demonstrates improved trunk control, the TLSO can transformed by removing the panels, replacing them with stays, or worn without any ridged components. It is a progressive TLSO system that can be modified to meet each child’s needs, even as those needs change. Click here for the SPIO® X and Expedition Treatment Plan. The Core-Max® Expedition is a flexible, prefabricated TLSO that provides trunk support throughout the thoracic region, includes a rigid posterior panel and soft anterior apron, extends from the sacrococcygeal region and terminates inferior to the scapular spine, restricts gross trunk motion in the sagittal plane, produces intracavitary pressure to reduce load on the intervertebral discs, and includes straps and closures. It is a prefabricated item that has been trimmed, bent, molded, assembled, or otherwise customized to fit a specific patient by an individual with expertise. A perfect match with L0456. 1. The Core-Max® Quest provides abundant and consistent proprioceptive input via compression. SPIO® orthoses provide two and a half times more compression than athletic compression wear. All SPIO® Orthoses are made of a high quality, specially milled fabric that is lightweight, wick-able and breathable. 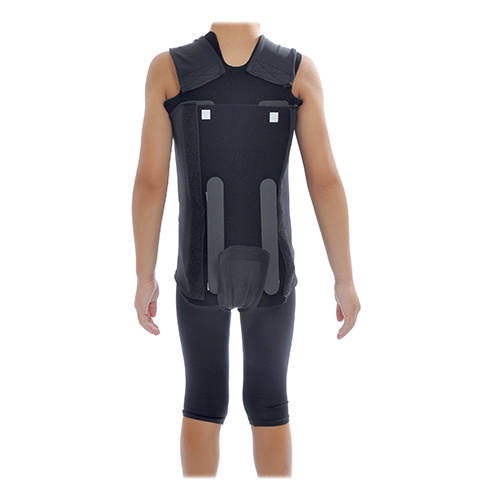 The unique SPIO® fabric maintains its compression, even after prolonged use and features high rebound properties and a strong neutral memory that assists the wearer in returning the body to mid-line. 2. 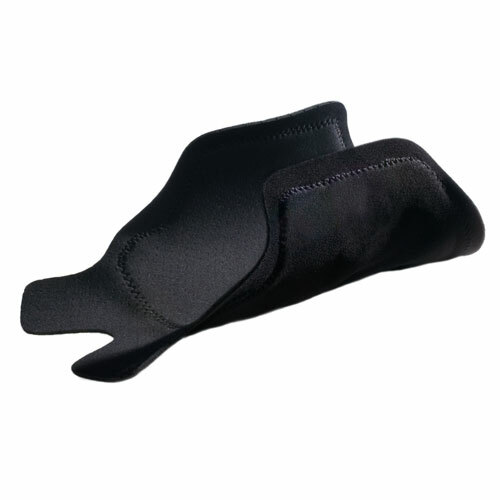 The Core-Max® Quest features two adjustable and removable Kydex stays that affix snuggly to the posterior back panel. 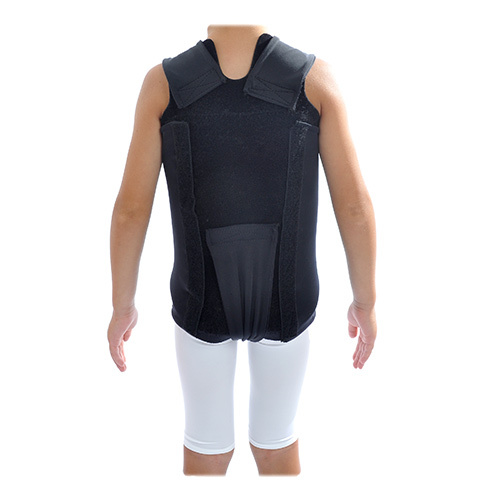 The stays are low heat moldable to match the contours of each child and provide additional low-profile stability for those requiring sagittal support. The Core-Max® Quest is a flexible TLSO that provides trunk support, extends from sacrococcygeal junction to above t-9 vertebra, restricts gross trunk motion in the sagittal plane, produces intracavitary pressure to reduce load on the intervertebral disks with rigid stays or panel(s), includes shoulder straps and closures, prefabricated item that has been trimmed, bent, molded, assembled, or otherwise customized to fit a specific patient by an individual with expertise. A perfect match with L0454. 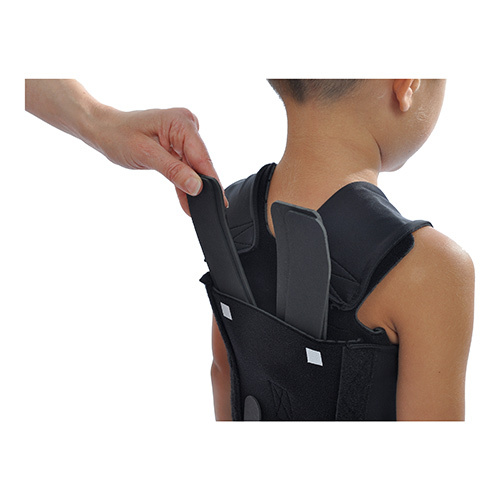 The Core-Max® Odyssey is a lightweight pediatric TLSO that includes a thoraco-lumbar, aquaplast back panel. It is designed with bilateral “wings” that hug the wearer and provide lateral support. The Odyssey incorporates all the benefits of a traditional SPIO® orthotic and provides postural/spinal support while still permitting the recruitment and development of core strength. 1. The Odyssey provides abundant and consistent proprioceptive input via compression. All Core-Max® orthoses are made of a high quality, specially milled fabric that is lightweight, wick-able and breathable. The unique fabric maintains its compression, even after prolonged use and features high rebound properties and a strong neutral memory that assists the wearer in returning the body to mid-line. 2. The Odyssey features a moldable thermoplastic posterior panel. This low-temperature, heat moldable panel can be fit as is or trimmed as needed. The Core-Max® Odyssey is a flexible, prefabricated TLSO that provides trunk support throughout the thoracic region, includes a rigid posterior panel and soft anterior apron, extends from the sacrococcygeal region and terminates inferior to the scapular spine, restricts gross trunk motion in the sagittal plane, produces intracavitary pressure to reduce load on the intervertebral discs, and includes straps and closures. It is a prefabricated item that has been trimmed, bent, molded, assembled, or otherwise customized to fit a specific patient by an individual with expertise. A perfect match with L0456.